apply to multihulls as well, you'll find the experience similar to monohull sailing with subtle but important differences. Those new to the sport have few preconceptions about how a multihull should perform. They find multihulls relatively easy and forgiving boats to learn on as they aren't trying to subdue years of monohull sailing instincts. Becoming proficient at sailing in general, and at sailing a multihull in particular, become one and the same. While experienced monohull sailors have a firm foundation in basic techniques they need to get over the mindset of comparing multihull sailing to sailing one-hulled ballasted boats. Once they can do that the process is easy. The boat you learn on tends to become your benchmark for what sailing is all about though handling varies remarkably between different designs. Despite the huge strides in market acceptance over the past few years there is still a tendency to lump all multihulls together. It is remarkable how cats differ more from each other than monohulls. Some sailors learn on a true cruising catamaran, quite a different experience from sailing a high-performance model. Your viewpoint on what sailing is all about also influences your approach to multihulls. Some sailors aren't really sailing unless they are heeled over, cold, wet and tired. If you above As the halyard is eased, gathering the spinnaker, even without the help of a spinnaker sock, is easy work for the crew on the spacious trampoline of this 43' catamaran. above Barreling along with 12 people aboard, at over 14 knots under spinnaker, is both safe and fun on a stable multihull. can relate to those sentiments you'll probably be disappointed with sailing a multihull. I personally have always taken great pleasure in the comfortable, protected sailing and quick passages a cruising catamaran provides. There are also plenty of psychological adjustments monohull sailors might have to make when switching to a catamaran. We have seen that most midsized, cruising cats have either low profile fixed keels (draft typically ranges between 2' to 4') or daggerboards for which the depth can vary from less than 24" with boards up to over 8' with boards down. It's a major adjustment for monohull sailors to cruise on a shallow draft multihull. It's not unusual to see them hyper-ventilating the first time they sail fast in five- to six-foot-deep, crystal-clear Bahamian water. Catamarans have no use for heavy ballast since their comfort and safety depend on their ability to remain perched on top of the waves. Good performance is linked to the designer's recommended payload, which is usually relatively light as compared to the boat's displacement. One reason many live-aboard and charter multihulls lack sparkling performance is because they've been loaded in excess of the designer's recommendations. You'll need to get used to the handling of a light displacement boat. Multihulls can accelerate rapidly; they may lose their way quickly upon heading into the wind, much to the annoyance of novice sailors as they attempt to anchor, approach docks or come about. 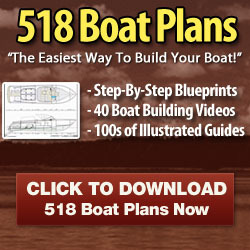 In general you'll need to head up closer to your desired stopping point than you would in a ballasted boat (a little unnerving in the beginning) and maintain boat momentum to make good gains to windward. While multihulls sail faster, the sensation of speed can be less than on a monohull due to one's higher seating position relative to the water and virtually no heel. Cats don't plunge and labor through the waves like a heavy displacement boat and simply sail faster with relative ease. They stay on the water's surface so their motion is lighter, quicker and less sustained in one direction. Some long-time monohull sailors miss the steadiness and responsiveness of a keelboat, but most have an easier time with the multihull motion. Others find it just as easy to be seasick on a catamaran. One of the first things you notice is the lack of heeling on a cruising cat. There's no need for constantly bracing yourself or your gear at unnatural angles. Sailing is more comfortable and less tiring which translates into greater enjoyment and safer operating conditions. Searching for a downside to level sailing, I'd say there's a lack of feedback that heeling provides the helmsman. With no appreciable heel and a reduced tendency for weather or lee helm on a cat, it's more difficult to tell when it's time to reduce sail. One must rely on boat speed and boat motion relative to the seas. 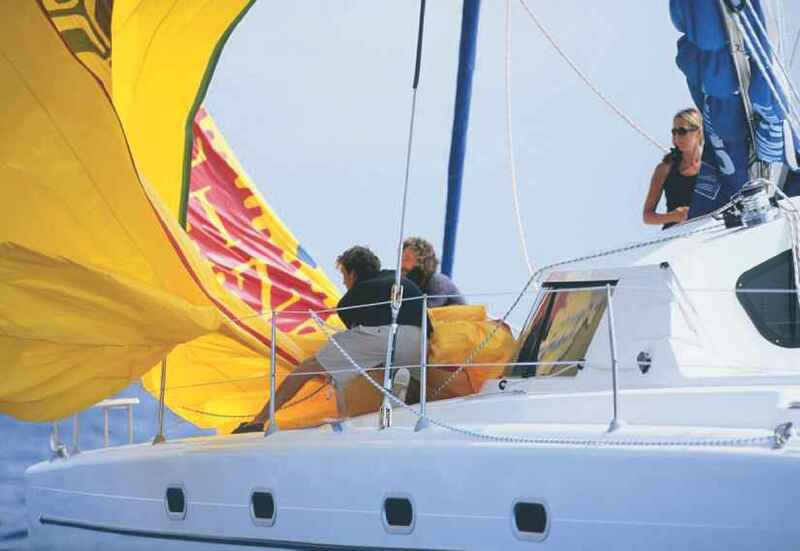 Multihulls have no real ability to spill a gust of wind by heeling; they typically translate excess wind energy into acceleration, which demands slight adaptation. Rapid acceleration is most noticeable on light displacement multihulls with high-performance rigs. I thought I knew what boat acceleration was until I sailed a Formula 40 cat on Long Island Sound with Olympic sailor Keith Notary. 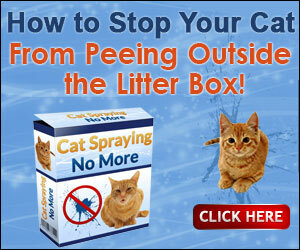 She went from 12 to 22 knots in the blink of an eye, quite normal, for high-performance cats. Cruising multihulls not only accelerate quickly, but they maintain higher average speeds than monohulls. In moderate conditions, even slower cruising catamarans sail as fast as monohulls, and attain higher top speeds in fresher conditions. Highperformance cruising cats, however, can surf at 20 knots or more. Sailing in highspeed mode is quite different, partly because everything happens much faster and partly because the Apparent Wind is brought far forward, to the point where a broad reach on a monohull becomes a close reach on a fast multihull, and a beam reach becomes close-hauled sailing. Most cruising multihulls on the market perform somewhere in between; as a rule you can expect to maintain smaller sheeting angles and flatter sails for a given True Wind Speed. 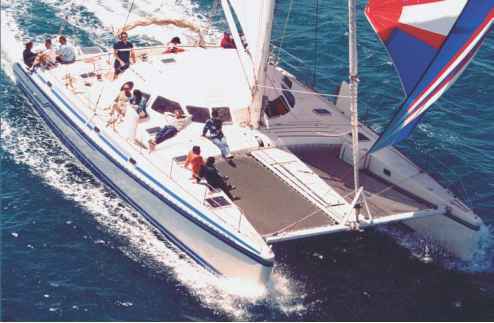 Catamarans have lots of room topsides for sail handling and crew maneuvers. 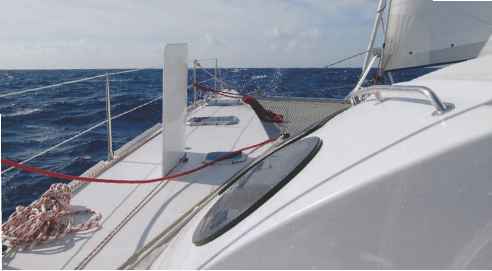 They usually have full-width travelers for the mainsail, and those designs with bridgedeck cabins have the added advantage of a saloon area, almost on the same level with the cockpit, providing good visibility of the surrounding water. This allows crewmembers to stay in touch with those in the cockpit and the general sailing conditions around them. It's not unusual for one crewmember to help navigate while at the same time tending to some domestic chore in the main cabin. Because of the lack of helm feedback, you may initially find it difficult to hand steer a straight course, especially sighting over the wide foredeck of a catamaran. The secret is to either sail by the jib's telltales or line up a point relative to the boat and use this mark as a reference. One will be surprised, however, how little one actually touches the helm on longer passages as 90% of the steering is performed by the autopilot. It may sound, and in fact it is, a contradiction to say that in many aspects catamarans are easier to sail. They provide more shelter than a monohull of the same size, no heeling, and often simpler sailhandling. But because multihulls sail so much faster they present circumstances that monohull sailors hardly experience or even know exist. left Sailing under mainsail and jib, the gennaker is pre-rigged and at the ready, to instantly add sail power when the wind lightens. far right It is often easier to learn sailing on a non-heeling boat, such as a large cruising catamaran. With its high steering position and flat decks, even children feel more comfortable taking over the helm. On fast catamarans it is highly important for sailors to be savvy. Navigation and anticipation must be earlier and reactions to fast-changing conditions must be made quicker. Since multihulls are wider than single-hulled boats, more stable and sail faster, they have to be handled in a different way. Catamarans have been sailing in the Western world for approximately 50 years. We have learned much from previous sailors, some of whom were pioneers of their time. Recent developments in engineering and design have created a new environment and the best boats ever. Although their handling is based on some older principals, there has been a constant push to attempt maneuvers differently and to improve on seamanship. Let's look at them in detail. Are catamarans easier to handle then monohulls?